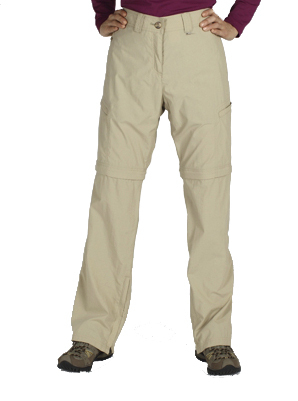 The BugsAway Convertible Ziwa Pant provides customizable sun protection with a UPF 30+ rating, dries quickly, and has security zip pockets to secure your things. The partial elastic waist moves with you when you’re most active, and the convertibles zip off to 10” shorts. Permethrin, the active ingredient in Insect Shield®, is invisible, odorless, and tightly bonded to the fabric fibers, and lasts the expected lifetime of the garment (70 washes). It repels mosquitoes (including those carrying West Nile virus and malaria), ticks, ants, flies, chiggers and midges (no-see-ums).Insect Shield repellent lasts 70 washings. Care Instructions Machine wash cold; No bleach or fabric softeners; Wash with like colors; Tumble dry low; Iron low setting; Do not dry clean.